Only when it was revealed that prime ministers and heads of state were targeted did the media coverage improve. Since early June 2013, the revelations by whistleblower Edward Snowden have changed our understanding of online communication. The leaks, published primarily by the Guardian, have provided evidence of mass surveillance of our social media uses; interception and monitoring of most online and phone communication; state-sponsored hacking into telecommunications services; the sabotage of security tools; and the compromising of internet infrastructure. Moreover, the leaks have documented how security agencies – including those in the UK – have operated with hardly any oversight and often in breach of the law. Even though many experts, scholars and activists had already foreseen a lot of what Snowden revealed and what journalists like Glenn Greenwald and Laura Poitras published over the past few months, the leaks have provided detailed proof of comprehensive surveillance and spy programmes that target all internet users (i.e., all of us!). They have made it impossible for governments as well as every-day Facebook users to pretend that such extreme interventions and blanket surveillance do not occur in democratic states and by trendy new-economy companies. Just a few minutes after the first release of the leaks in early June, calls for a Pulitzer Prize for Glenn Greenwald and his fellow journalists working on the story were circulated on Twitter. As we read the extraordinary stream of information about state surveillance, we also witnessed an outstanding journalistic coup. The Guardian and the Washington Post explained to us how the state watches and analyses the ever increasing part of our lives that is inseparably intertwined with digital communication – including not just what we say but what we ‘like’ and, in many ways, what we think. The revelations were a great moment of investigative journalism and exemplified impressively the ‘watchdog’ role of the classic ‘4th estate’ of the press. Unfortunately the months since then have also shown us this watchdog role is often the exception rather than the rule. On both sides of the Atlantic, media claimed that surveillance is not worth much attention; focused their coverage on the messenger instead of the message and reported on the lives of Glenn Greenwald and Edward Snowden rather than the issues they had revealed; or even attacked their fellow media organisations for reporting the leaks. Newspapers like the Times and the Daily Telegraph accused the Guardian of threatening the security of the country and thereby placed themselves at the service of the government and the spy agencies. The BBC coverage was limited, at best. Whereas the revelation on September 20th that the British secret service had hacked into the Belgian telecom operator Belgacom to spy on EU institutions raised a lot of interest outside the UK, the BBC failed to report it at all. One of the few larger reports, a Newsnight programme, was memorable mainly for Glenn Greenwald having to explain and defend the basics of investigative journalism. Chris Blackhurst from the Independent wonderfully expressed a prevailing mentality by seriously asking what would give him the right to question the security agencies. The answer that this is his job is apparently not obvious to everyone. Only when it was revealed that prime ministers and heads of state were targeted by surveillance programmes did the media coverage become slightly broader and more serious. A peculiar aspect of much reporting has been a strong caution (to put it mildly) towards the facts (i.e., those undenied and undeniable facts that were revealed in the Snowden leaks) and a complete lack of caution towards claims and beliefs (particularly, those coming from the government and spy agencies), even when the latter were in direct contradiction with the known facts. We have seen more ‘lapdogs’ than ‘watchdogs’, and more than that: In addition to cautious and perhaps inadequate journalistic work, we have witnessed active support by some media for secret governmental programmes against the citizens and civil society of this and other countries. Rarely is it mentioned, in this regard, that surveillance fundamentally questions journalistic work as such – at least in its form of investigative journalism that requires confidential communication with sources. The Snowden case, just like the WikiLeaks/Manning case before, has demonstrated both the relevance and the transformation of whistleblowing. Technological change and mass data processing have affected what can be leaked, where it can be published, and who can be a whistleblower. Whereas 40 years ago Daniel Ellsberg had to photocopy the Pentagon Papers page by page, Chelsea Manning could copy hundreds of thousands of documents on a CD-ROM and upload them to WikiLeaks. An estimated 2-3 million army and government personnel had access to the files that were later published by WikiLeaks and its partner newspapers in the “Cablegate” releases, the “Iraq Warlogs” and others. Snowden was merely an external contractor but nevertheless had access to documents that proved to be of huge public and international diplomatic importance. For governments, the broad access to, and easy distribution of, data have become a major problem. Their reaction has been an unprecedented repression against whistleblowers. The Obama government has prosecuted more whistleblowers than all previous administrations together. The “war against whistleblowers” has led to a global hunt for Snowden and a prison sentence of 35 years for Manning, but also to a rise in information control overall. In the US, for example, the “Insider Threat Program” has been implemented across areas of public admininistration that deal with sensitive data to monitor systematically which employees might pose a risk to data control. Every “suspicious” behaviour by colleagues has to be reported . Uncovering governmental misconduct is officially becoming “terrorism”. When David Miranda was detained at Heathrow airport for nine hours in August and questioned in relation to the Snowden leaks and the Guardian reporting, this was done on the basis of UK anti-terror legislation. The earlier raid by security agents of the Guardian offices and the destruction of Guardian computers highlighted, similarly, the recent challenges to press freedom and the conflation of media work with crime and terrorism. These cases demonstrate also how authorities just take for granted that anti-terror laws can be expanded in this way and that press freedom can be attacked, without any expectation of opposition. Even the Guardian reported about the extraordinary visit to its offices only several weeks later. As these examples show, the surveillance scandal affects not just our online communication but broader democratic institutions and key democratic rights. Just as it changes state-media relations, it affects the interactions between state and society. Blanket surveillance undermines critical debate and dissident voices – a key feature of a functioning democracy. State activity, on the other hand, increasingly takes place in secret, and democratic control of security agencies is virtually non-existent. The FISA courts in the US have added merely a pseudo-democratic fig leaf to unrestrained state surveillance, and in the UK even members of cabinet and of the relevant oversight groups have claimed they didn’t know about Prism and Tempora. Democratic processes and institutions are thereby turned into secret parallel worlds, which may have far deeper consequences for democratic states than surveillance as such. 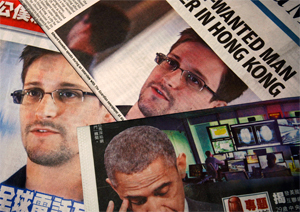 The Snowden leaks have highlighted several trends in digital communication. These have been discussed heavily over the past few months, and so I will just briefly point to a couple of them. Generally, they remind us of the challenges to (or, potentially, the end of) the free borderless cyberspace. Similar to the increasingly wide-spread filtering and blocking of content, surveillance points to fundamental restrictions of free online communication by governments and state institutions. More specifically, the leaks highlight the problematic role of internet companies like Google and Facebook that are at the centre of programmes such as Prism and work closely with state authorities. They show us the vulnerability of our daily communication practices which are increasingly dependent on services provided by these companies. Despite intimidation and criticism, the Snowden leaks have turned into a vast stream of information and the Guardian has continued to report. Street protests have started in some places as part of the campaign Stop Watching Us. A global petition, supported by the leading digital rights organisations worldwide, is currently collecting signatures to demand an end to mass surveillance. Organisations such as the Open Rights Group are campaigning at the national level and putting pressure on the UK government. The Group and two other organisations are currently challenging the UK surveillance regime by taking the UK government to the European Court of Human Rights. On a more individual level, more people have started to use anonymization tools such as Tor, have become interested in encryption tools such as PGP, or have started to use non-profit activist-based internet services such as Riseup.net and Aktivix.org. If the leaks are a turning-point towards a more critical use of social media – and perhaps a more critical engagement with government claims – they already provide a historic moment with significant impacts on our lives and society. A longer version of this article was published – in German – in the book “Überwachtes Netz – Edward Snowden und der größte Überwachungsskandal der Geschichte”, edited by Markus Beckedahl and Andre Meister, 2013.